A while back we had a client that was migrating out of their existing domain and into a new SBS2008 installation. 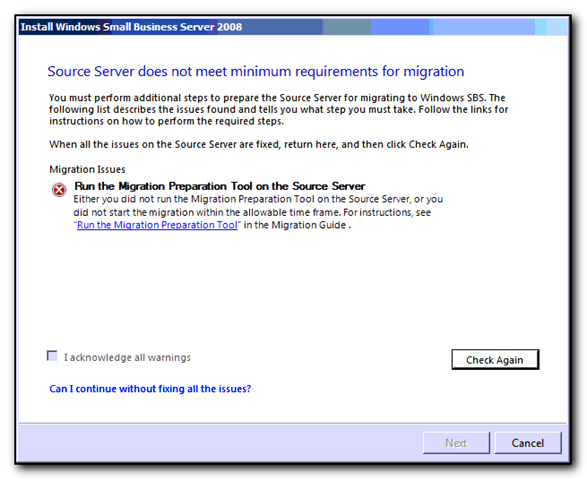 One of the things I learnt (too late) was to disable folder redirection before doing a migration otherwise clients will still point to the old server. Unfortunately I did not have access to the old server/domain but I had got a copy of the redirected folders and thankfully there was no real data on the server to be migrated from the redirected folders. However to fix the redirected folders I had to use csccmd to remove references to the old server which was easy enough using “csccmd /unpin2:\\oldserver\share /recurse”. I then changed the registry entries in HKEY_CURRENT_USER \ Software \ Microsoft \ Windows \ CurrentVersion \ Explorer \ User Shell Folders to point to the new location. This worked fine for every machine except one. This particular machine had a very strange symptom in that when clicking on the Start/All Programs button the machine would pause for about 20 seconds and then nothing would happen (to the end user). Behind the scenes the Start Menu, Startup and Programs entries in the registry would get deleted. I tried to use ProcessMon from sysinternals to monitor the registry setting but I either got too much registry information to work out what was going on or nothing at all (depending on the filters I had applied). I was asked in the comments why I migrated from MovableType to WordPress. There were several reason why I decided to make the switch. The primary reason was the incredibly long time it would take to publish a post in MT. I could actually hit Post in MT, fire up a new web page, connect to my testing WP site, create a new post, enter the title, paste the content in, hit publish and then view the website. In the meantime MT would still be thinking about saving the original post. The time taken to republish the site after a change such as a design change was so great that some of my older posts still had old styles as the republishing system would time out before it could complete the task. One of the other things I really like about WordPress is the ease of upgrading the software to the latest version. Yes, WordPress has had more releases, but when it takes about 2 minutes to upgrade the system its really not a problem (especially now that there is an automatic upgrade function). MovableType has also just released a new security release which is one of the reasons why I made the switch *now*. I was also hoping that the spam filtering would be better on WordPress than MovableType. I’ve had several idiots spamming the blog with russian comments in MovableType – they wouldn’t get through but I would have to go and delete them. In the one day that I’ve had WordPress up I think I’ve had more spam comments get through to the spam queue, but again it was easy to delete them all – a “select all” option and then delete, followed by an “all done” about 3 seconds later. The big concern about switching from MT to WP is typically due to the fact that WP is database driven and therefore doesn’t have any of the pages (by default) saved on the machine so if the database is down, then so is the website. This site doesn’t have that many visitors so I don’t see this as being that much of a problem and normally if the sql database is down, then its probably likely that the web server is going to be down too. I’ve not looked at the various caching plugins as I doubt I’m going to need it, but it is nice to know this option is available. I may switch it on later once I’ve got the site up and running and I’m not making many design changes to it. For those of you interested, I will also be posting my experience about the upgrade and some hints and tips – the existing WordPress migration documentation is in dire need of being updated! I was hoping to get the switch from MovableType to WordPress up and running for the 1st of January but I didn’t want to go live until I was ready and near a keyboard in case there was problem. I’ve spent several hours this weekend getting the layout and stuff ok to go live. For those of you using feed readers to see this, you probably won’t see much difference although I have added a few options to the feedburner feeds and also include my delicious saves now. Do stop by the main website and let me know what you think though. Any issues then let me know, most of the work and testing was done with firefox as that is what most of you use. There are a few cosmetic issues with internet explorer that I’ll work on over the next week or so. I’ll also be posting some hints and tips on the migration steps too.